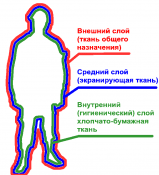 Engineers and technologists of Energoform have developed a series of highly effective models of conductive clothing representing the new generation of means of personal protection against electromagnetic fields. 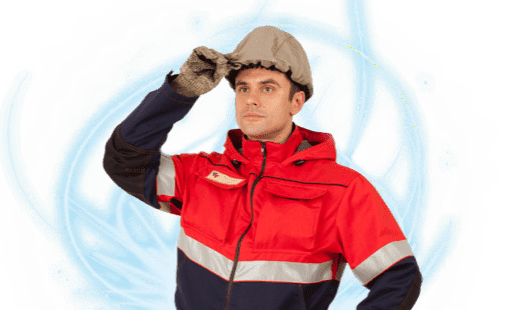 Each element of the kit – boots, gloves and clothes are manufactured with the use of conducting materials and are galvanically connected between each other. Thus, a closed shielded area, the so called “faraday cage”, is created around a person, effectively weakening the electromagnet field intensity. The external layer of clothes is made of the general-purpose fabric; in addition to common protective functions, such as oil- and water-repellent ones, this layer also protects the shielding fabric against external aggressive factors (water, acids, alkalies) at dry cleaning, for example. The external layer can be made of material resistant to electric arc action and having constant protective properties, such as Nomex®. The intermediate layer consists of shielding fabric representing the product of up-to-date high technologies. Particularly, 1 or 2 layers of multi-component alloy containing copper, nickel, silver and some rare-earth metals are applied by means of electroplating to the prepared basis with the specified characteristics. The distinctive feature of this technology lies in application of conductive layers to every thread. That is why the fabric features not only the excellent shielding properties but also good hygienic qualities. The internal layer is made of cotton fabric and just like the external one in addition to its common functions it protects the shielding fabric against moisture attack (human perspiration). The kits intended for winter use are equipped with removable layer of underlining and can be used in autumn and spring. The shielding boots are manufactured three-layered with a sole made as per the special technology with the use of combined oil and petrol resistant rubber of high electrical conductivity. The shielding gloves are made of complex yarn on the basis of para-aramid fiber with network of carbon, silver-plated and cotton threads. Such structure provides for high mechanical strength, excellent electrical conductivity and good hygienic properties.